An expedition with America's favorite two college quarterbacks and summer camp roommates. Dr. Clock: Now that’s a fine time keeper. Classic rolling “cat eyes.” Cheshire grin. Its second hand is made of a sharp ruby plastic. Minute and hour hands an elegant, matching black. Johnny Manziel: I don’t know. Dr. Clock: Did I mention that similar models were once used by Doug Flutie, Vinny Testaverde and Charlie Ward? Johnny Manziel: Didn’t Charlie Ward end up playing for the Knicks? Dr. Clock: Yes, but first he won a Heisman. Plus, he went to the 1999 NBA Finals. I’d expect someone like you to know your history! Johnny Manziel: No, no. Sure, I knew that. 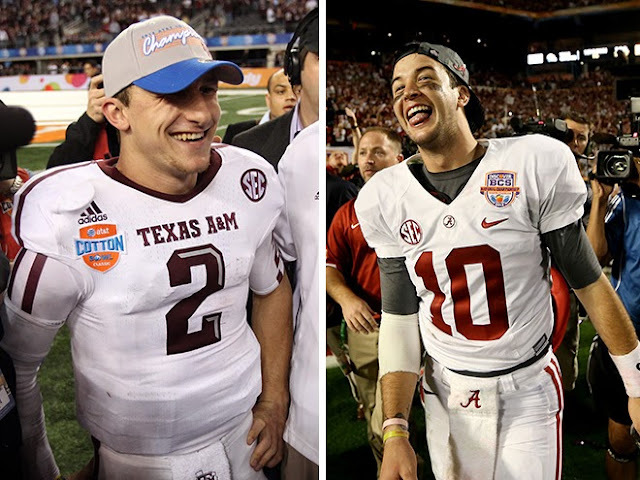 Johnny Manziel: What do you think A.J.? A.J. McCarron: You’re your own man, Johnny. I’m not going to speak on another man’s business. That’s just how I was raised. Johnny Manziel: Sure seemed like you were quick to “speak on another man’s business” when you decided where we went on vacation. A.J. McCarron: When it comes to Cancun, I was raised to speak my mind on the matter. Dr. Clock: You need a clock with a robust alarm, correct? Dr. Clock: Forceful. Loud. A clock like a strong black cup of coffee! Johnny Manziel: Definitely. You heard about what happened at the Manning Passing Camp the other week? Johnny Manziel: See, I’m a real heavy sleeper even when I haven’t been out drinking, which I didn’t do there because I was too busy picking Peyton and Eli’s brains for quarterback tips late into the night. Then, while I was in one of my classic "deep sleeps," my phone died so my alarm never went off. And A.J. here didn’t even have the decency to wake me up. A.J. McCarron: My name is A.J. Your name is Johnny. You’re your own man. Dr. Clock: Boys, there’s no need to worry; I have just the thing for you. Johnny Manziel: What is this, Doc? Some kind of secret passageway? Dr. Clock: No, I just wanted to read this book later. Dr. Clock: The Harry Potter girl wrote it you know. A.J. McCarron: Oh, my girlfriend wants to read that! Dr. Clock: Maybe when I’m done. Johnny Manziel: You’re a sports nut, huh, Doc? Dr. Clock: You could say that. Johnny Manziel: So, what do you have for me? Dr. Clock: What do you think? Johnny Manziel: A mirror? C’mon, Doc! What is this, some kind of symbol that I should “take a look in the mirror” and see what I’m made of? This is bull! Dr. Clock: No, it’s also a high powered cell phone/alarm clock with a diamond-lit screen, Chinese Invasion level alarm volume, access to the Second Internet, and it has a dual-powered energy source: part solar and part nuclear. Press that small button on the side. A.J. McCarron: My God is dead! Dr. Clock: Pretty impressive, huh? You know who loved that? Tim Tebow. Johnny Manziel: Well, Doc. I can’t thank you enough. Johnny Manziel: I just gotta know. Why do they call you Doctor Clock? Ryan Braun: Hey, Doc. Looks like it’s back to the drawing board. Dr. Clock: I’ll meet you in my office, Ry Guy. Dr. Clock: And you thought that you had a bad week? Johnny Manziel: Eh, seems alright to me.